get-more-pay-less has no other items for sale. 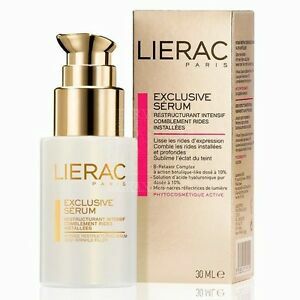 Details about LIERAC EXCLUSIVE SERUM~INTENSE DEEP WRINKLE FILLER 10% HYALURONIC ACID!~NIB~$98! LIERAC EXCLUSIVE SERUM~INTENSE DEEP WRINKLE FILLER 10% HYALURONIC ACID!~NIB~$98! NEW Clarins Mission Perfection Serum 1.7oz / 1.7 oz. I have been using this serum for three weeks. I love the way it feels on the skin and has a pleasant fragrance. It seems to have somewhat diminished lines around mouth and chin, I definitely would check this out if you are looking for a good moisturizer for day and night.